Pen and black ink over graphite, on illustration board. Signed and dated in ink at lower right, "Edmund J. Sullivan. 1905"; at top, "A Modern Utopia" (46 [section sign] 3) The fear that often turns a woman away from a beautiful marriage to a mercenary marriage will vanish from life. Title from published volume's list of illustrations. Original drawing for an illustration for H.G. Wells' "A Modern Utopia," London : Chapman & Hall, 1905, p. 100 (facing). 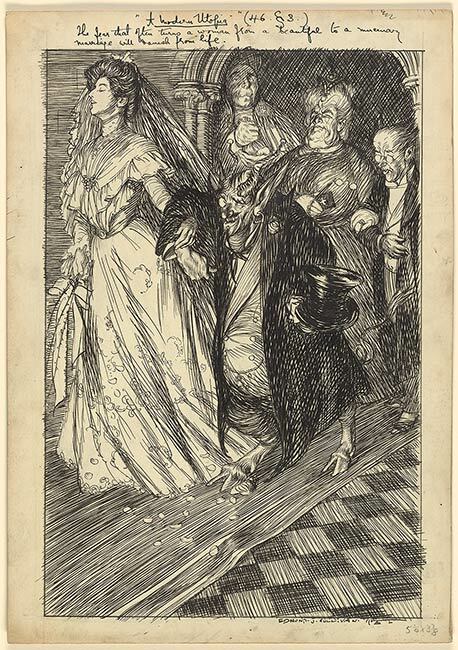 Drawing shows a young bride proceeding down the aisle to the altar with a grotesque devil at her side as her groom.